In 1951 Tolkien, like Théoden King when we first met him, can have had little hope of success. By his death-day, however, he could well have said that, like Théoden, when he went to join his (philological) fathers, "even in their mighty company I shall not now be ashamed." Tolkien left a legacy as rich as any of his predecessors. 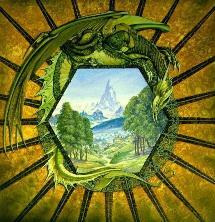 Shippey's book is not a biography but an analysis of the writings of J.R.R.Tolkien. "The core of the book consists of three chapters that examine The Lord of the Rings as a linguistic and cultural map, as a twisted web of story, and as a response to the meaning of myth." He explores in great detail, the unprecedented appeal of Tolkien's work and its place in literature. Readers will find Shippey's book wonderfully readable while dealing with complex analysis. Shippey's wit shines through as he takes on the Tolkien critics and makes his case clearly and emphatically. He is organized and systematic in the presentation of his ideas and analyses. J.R.R.Tolkien, Author of the Century makes a compelling argument for the case in point, as well as being an incredibly illuminating book to read. The Lord of the Rings (1): Mapping out the Plot - "One of the most undeniable (and admirable), if least imitated qualities of Tolkien's eventual sequel, The Lord of the Rings, is the complex neatness of its overall design." The entire chapter is simply brilliant. The Lord of the Rings (3): The Mythic Dimension - Pay close attention to a small but wonderful discourse on Saruman and Denethor: technologist and reactionary. Afterword: The Followers and the Critics - The entire chapter is fascinating but of particular relevance is the short piece on Tolkien's Legacy.